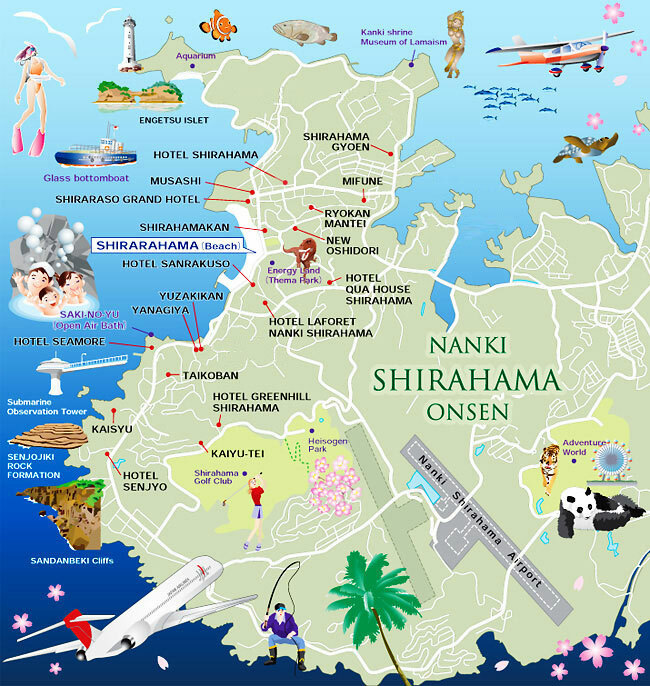 There are various kinds of hotels in Shirahama Onsen area. Some hotels are traditional ryokans, (traditional Japanese inn), emphasizing Japanese cuisine while others are larger and offering quality services with comfortable facilities. With a menu of more than 150 items revolving around premium ingredients only available here and themed on local production for local consumption, Shirahama Saichoraku will greet you with meals like you’ve never experienced before. WiFi available in all rooms. ranging from 8,100 ~ 13,500. Enjoy quiet onsens surrounded by nature and located in central Shirahama. An eighteen storied ryokan with useful facilities. Located near the Shirarahama Beach. Located on the Shirahama Beach front, all rooms face Shirahama Beach. Features cosy Japanese Style rooms and Onsen baths. Located in front of Shirarahama Beach. Features 15 unique baths, swimming pool and athletic room. Located in front of the Shirarahama Beach. All guestrooms offer the ocean view. Located near Shirahama Beach and offers ocean views from many rooms. Outside open baths and swimming pool available. Features fantastic sunset views and indoor and outdoor Onsens. Auberge is a restaurant with attached accommodations. Relax and eat your fill of full course meals making use of local ingredients. Large hot spring bath and private family baths also available. Located on the tip of the peninsula, this modern Ryokan offers unisex hot-spring the ocean view is wonderful. Located in Onsen Park, all rooms feature outside Onsen baths. ranging from 7,500 ~ 11,500 yen(By Tax). 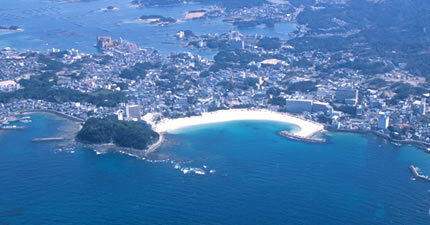 Located on a high elevation in Shirahama, get a birds-eye view of the area from our outdoor onsnes. * Prices above are approximate rates. * They are for one adult when booked with a group of two guests. * For rate details and options, please check their homepages above. * Onsen bathing tax 150yen is not included.